It's really hard to find a group here people don't seem to be in lfg anymore. Anyone know why? Is it because of the green boss drops? Is it because people just want to hurry on to Outland? Dire Maul is a beautiful zone. Loot is great and to be honest, the conservatory is breath-taking. With the new Dungeon Finder from 3.3, I've been running this long forgotten dungeon and I'm glad I am. Nice place overall. Just wanted to post, you CANNOT sneak by the warpwood crushers even at lvl 80, they still attack you. While i will probably regret asking..what exactly does a "tribute run" of this place entail? The quests which include the Librams, Abom Stitching, Blood of Heroes and such, DO NOT count towards the Loremaster of Kalimdor. I just spent 300g getting the Pristine Black Diamonds to turn in the quests and the achievement tracker for that did not move. /Really annoyed. Okay, I hopped down into the arena to tame The Razza...how do I get out? In Cataclysm DM North will change slightly but not too much. I have read many posts about Knot's quests no longer being available due to the changes coming to DM North in Cataclysm. Note, these post is based on info from Build 13277 of the Cataclysm Beta and as such any information posted here is subject to change before Cataclysm launches (as is everything on the beta at present). DM North does not require a key to enter. The tribute run is still possible. (Rewards blues mostly, level 44 requirement to wear, all BoP that I saw). The first guard does not drop the Inner Door key and the Inner Door is no longer locked. The second guard still has his chest to get the courtyard key from which is still required. Knot is still present down near the 3rd guard. (Ogre suit definitely possible). After 2 full clears (full tribute runs) no shackle key dropped from any trash. Several trash packs have been removed (at least 10 that I counted). Less chances to get a key per clear. Layout is identical to pre Cataclysm. All bosses appear to drop blues where they once dropped greens, same loot just better quality. Boss HP values have been noticeably buffed as well as level substantially reduced. 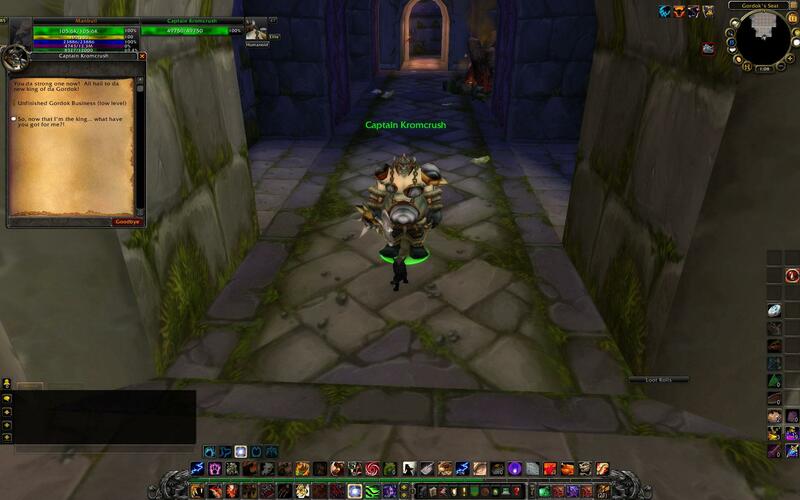 Confirmation screenshots taken 11th November Cataclysm Beta build 13277. 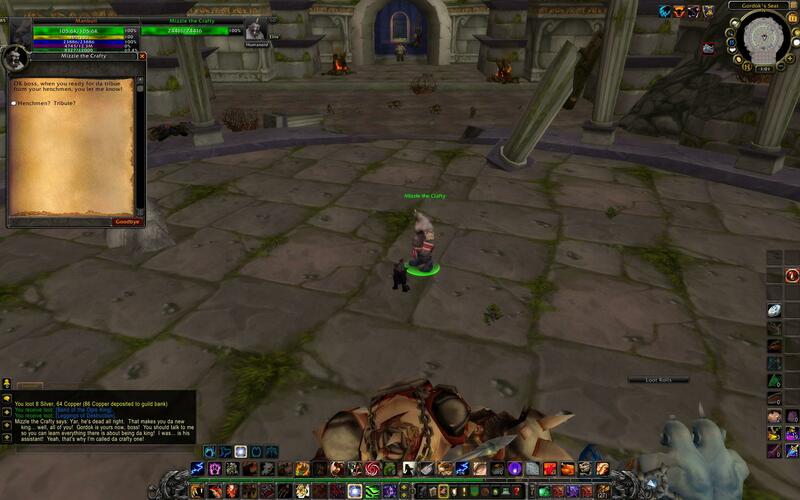 It is divided into three different instances in the LFG tool in Cata. Lots of excellent comments on where to farm by some very informed folks, but, alas, it is all dated with the new world of Cat. I spent several hours looking for a good farming spot for Runecloth and I found one in the new, up-leveled Swamp of Sorrows. This is now a mid-50's zone. I had good luck in the new Bloodmire Camp. 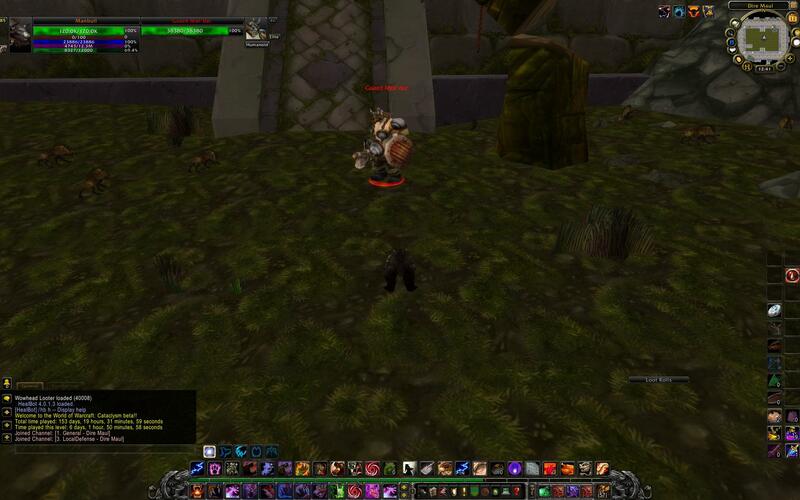 The horde NPC's even help you kill the Marshtide Footman. Normal drop rate is at least one piece of cloth a kill. In case anyone is wondering, even with the changes in the shattering, the tribute run is still absolutely worth doing. We killed the first boss only, and got 4 blues out of the tribute chest and 2 off of the final boss. If we had NOT killed the first boss, you get an additional quest when you run back and talk to the guards which gives you one more blue. All said and done with the two quests you get in DM North and the tribute chest that's a drum total of 8 blues, a darn good chance to get a gear upgrade. 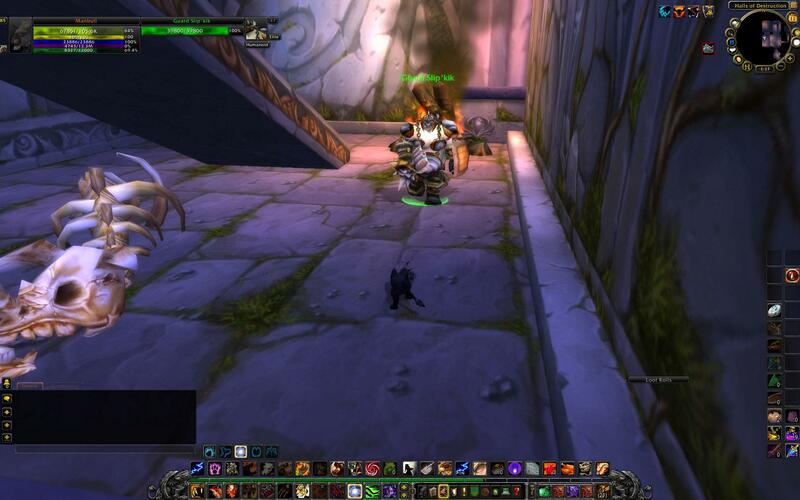 To get into Dire Maul in Cataclysm. With a flying mount it's very easy. Go to (65, 35.5). Entrnace is in a little door. Or go to (44, 67). Portal right inside a little archway. ...You mean that, in order to grab the quests for Enchanted Thorium Platemail, I have to level beyond the level range to random it? Might need to update the levels on this. The quick facts says it is a 44-47, but I've been hitting this in dungeon finder since 40 (maybe even 39?). Bosses in the east wing are all 40-41. 4. 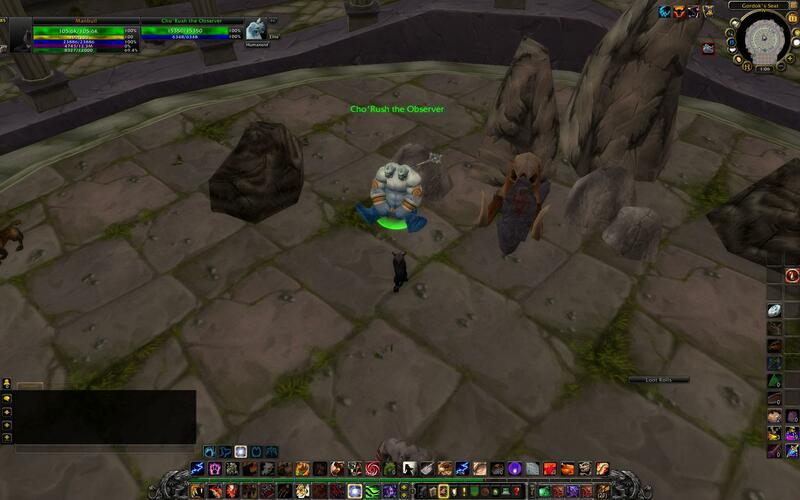 Be sure to get the key in the middle of the instance courtyard from the chest (sitting all by itself, you really can't miss it) as you will need this key to get to King Gordok. 3. Don't forget to kill the elementals around the pylons both inside his prison area and above it...drop down, kill the big tree if you want, expect a mob to attack you if you decide to. 4. There are 2 pylons in the prison area...kill the elementals, burn down Immol'thar...enjoy the fruits of your labor by getting the achieve. I found that DM North is the hardest instance by far while leveling these days. As a priest healer, I could hardly keep up with the insane amount of damage the tank was receiving (about 400 every hit, if not more). If you still have a Class Book (the ones that give you a class trinket), you can still complete it. Go to the Aethenaeum, "use" the book and get the quest. The NPC will accept your book and give you the trinket. I'm going to just clarify something in the West wing: To get into the Prison of Immol'thar, the door is in Tendris Warpwood's room, but be sure that you kill the elementals surrounding the 3 pylons before you go into the prison. Saves alot of time, so you dont have to go back and get those and then come back to the prison. I'm confused. I kill the Prince and now I ran down this really long tunnel to a door, but there was no way to open it. How do i get past it? ty. Instance entrance to Dire Maul North is 62, 25 (Feralas). 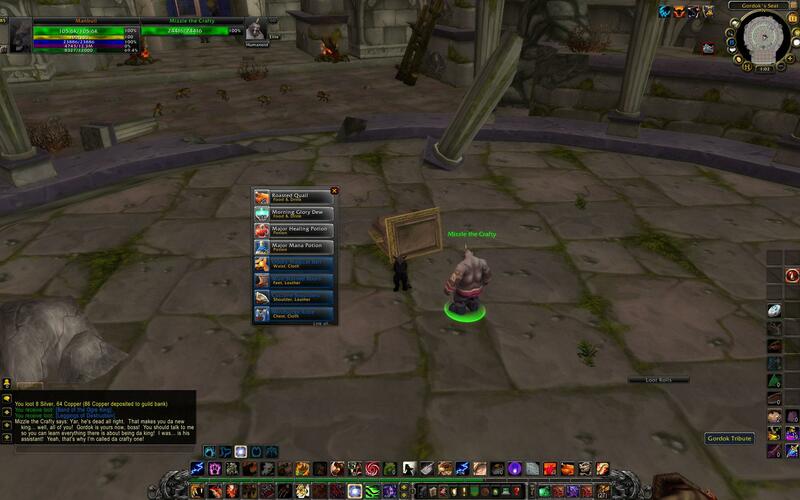 As of 1/5/12, are the rares still spawning since Cata came out? Every time I go looking for them, they are never there in the arena. Since the cataclysm, I have not found any activity in The Maul. No herb node spawns, no boss spawns. I haven't spent extensive time camping there however. Can anyone confirm/deny this? It appears the exit tunnel in Warpwood Quarter has been sealed off. Quite a shame, I enjoyed the bonus of a few Thorium veins after getting through that section. Not one comment above help me find the entrance to Gordok Commons. I KNOW THE INSIDE HALLWAY LEADS TO A DEAD END. Where is the entrance.? OK Here it is. The entrance to GORDOK COMMONS is at 62 24 in the Broken Commons In Feralas. To the right is the door that no longer opens and the entrance is on the left if you are facing North. oddly Prince Tortheldrin is not part of the Lead boss's for achiv, Immol'thar is. meaning players can skip The prince if they want if Ppl notice They got the achiv. Blizz should fix this so that they don't flee Before realizing they have a guy left too kill. P.s. Strange,that none has gaved coords,it took some 5 mins to find all of the main entrances... I was going to get achievement + quests. And where is the summoning stone? Meeting (Summoning) Stone for Dire Maul is located at 58.00, 44.54. EDIT: Not understanding downrate when this was an accurate reply to an earlier question (post below from 2012/06/16). I hope this helps, I am trying to record a review/playthough of every dungeon in the game.... it's a long process! Will someone please post a map with the entrances to the dungeon on it! I've not been there yet, and will be doing them solo as they are grayed out for me. I went in one, but there's only a few rooms in it. NO need for sarcastic or stupid remarks. I can't find it now, but when I was reading the comments before going into warp wood quarter, someone commented that they missed being able to get thorium ore after running through. You can enter this dungeon on foot at lvl 31. You can queue this dungeon as specific dungeon lvl 36-46. In the specific dungeon finder, this dungeon is orange difficulty lvl 36-37, yellow difficulty lvl 38-42 and green difficulty lvl 43-48. You can queue this dungeon as random dungeon lvl 38-41. You have to be lvl 36 to obtain the quests. 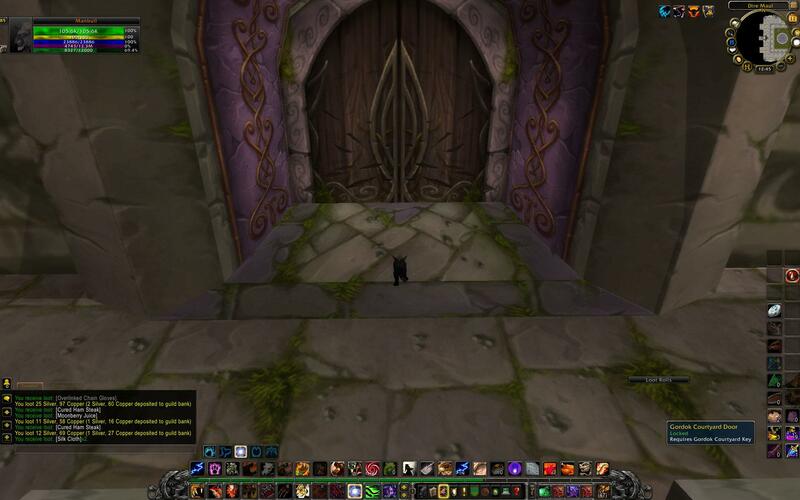 You can queue this dungeon as specific dungeon lvl 39-49. In the specific dungeon finder, this dungeon is orange difficulty lvl 39-40, yellow difficulty lvl 41-45 and green difficulty lvl 46-49. You can queue this dungeon as random dungeon lvl 42-44. You have to be lvl 39 to obtain the quests. 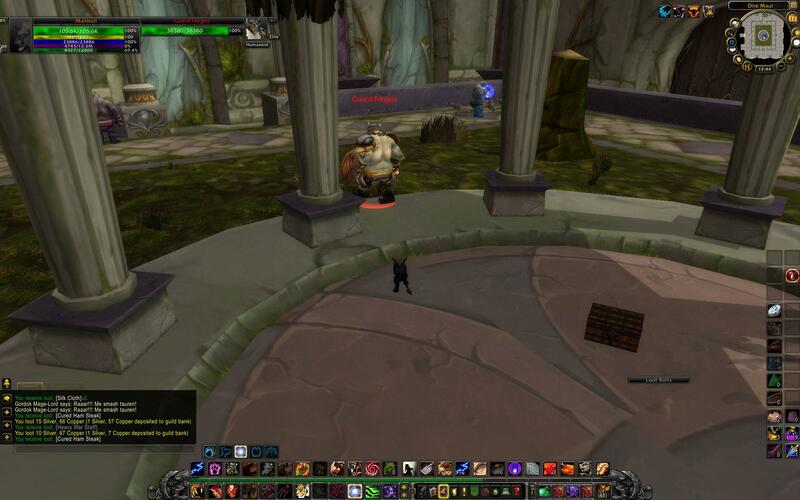 FYI .Dire Maul was once gladiator arena where King Varian Wrynn fought for his life after caravan of orcs led by the gladiator trainer Rehgar Earthfury found him washed up on the shores of Durotar and took him here . After many bloody battles, he emerged the victors of the Crimson Ring tournament. Impressed by Varian's skill at arms, the crowd gave him the orcish moniker "Lo'Gosh" — which means "Ghost Wolf". It should be noted that any items above ilevel 50 that are not boss drops should be disregarded as they were gathered pre-Cata nerf of the dungeon level. 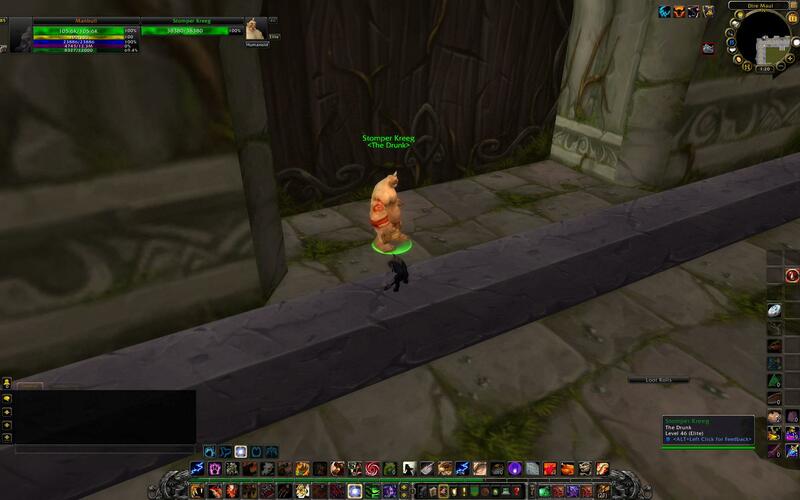 Combined with the arbitrary removal of most other random mobs of the same level throughout "Classic" content, you will have to look elsewhere for Glorious Legplates, Vanguard Legplates and Lofty Legguards in particular. The MapID of Dire Maul is 699. This is used for any WoW API function that requires a MapID. Dire Maul and the old Sunken Temple remain my absolute favorites. When I was high enough to solo them I would get a kick out of guiding twinks through them. Really well designed instances. Whoever designed them deserves an award. I am 100 now in 699 gear and I still love Dire Maul. Pity Sunken Temple got completely nerfed. People might not know this but sunken temple was originally about five times larger, with intricate codes to be unlocked etc. I never understood why they did that. Anyway fun times. N DM (Gordok Commons) have special for Gordok Tribute. I know mostly don't care and but the reward is nice. Also there is chance for Treant's Bane from the Tribute Chest Run. If high lvl doing that for mog then go for it. 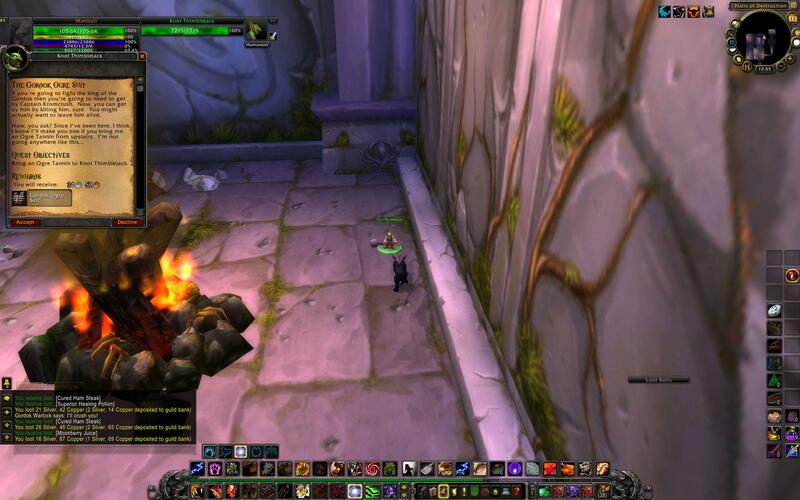 Let lowbies doing bonus objectives for killing all guards from random dungeon. Each Wing Contains The Following Bosses. Zevrim Thornhoof – Desperate to show his worth to the Burning Legion, Zevrim Thornhoof told his masters he could enslave the formidable ancients who still roamed Dire Maul. When his own power proved insufficient, Thornhoof turned to other living creatures for additional energy, butchering them atop his sacrificial altar and harvesting their essence in their final, agonizing moments. Hydrospawn – When the satyr Zevrim Thornhoof sought to control the elementals in Dire Maul, he focused on Hydrospawn, who calmly resided in the pool beneath his altar. As he performed his profane sacrificial rituals, the elemental grew agitated and restless, striking out at Thornhoof's demonic minions. As the years passed, Thornhoof used his victims' energies to whip Hydrospawn into unbridled fury, little by little binding its will to the satyr's commands. Lethtendris – Dire Maul's warped energy drew Lethtendris from afar, giving her hope of satisfying her unbearable craving for arcane magic. Using the sinews and ligaments of sacrificial victims, she constructed a web to siphon the corrupt power out of the east wing. To her delight, she discovered that the device has the capacity to gather vast reserves of overwhelming strength, enough to destroy all of her enemies. Alzzin the Wildshaper – Alzzin the Wildshaper seeks nothing less than the total corruption of Feralas, but until he discovered the Shrine of Eldretharr in Dire Maul, he had little success. With the power of enslaved ancients at his command, Alzzin concentrated the vitality of the surrounding forest into his lair, allowing him to manipulate it at will. Tendris Warpwood – Tendris Warpwood was a staunch defender of Eldre'Thalas, his heart inexorably entwined with the fate of the city. When the Sundering shattered the land, his resolve never wavered, but as corruption seeped into the ruins over the next 10,000 years, so too did it infect the ancient's spirit. Illyanna Ravenoak – Illyanna Ravenoak, along with her faithful companion Ferra, was once Prince Tortheldrin's most valued hunter, until she refused to carry out her leader's order to execute her friends. 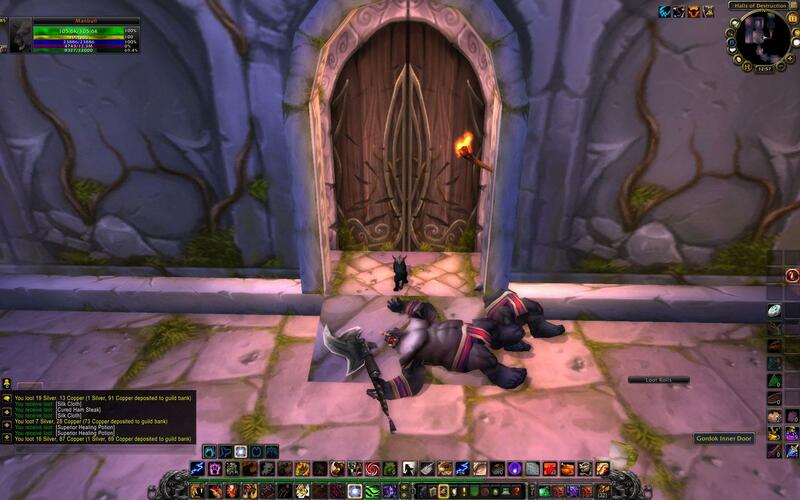 As punishment, he killed Illyanna and her bear, but he used his demonic power to bind their spirits to their bodies, condemning them to remain in Dire Maul as undead protectors. Magister Kalendris – When Prince Tortheldrin demanded the slaughter of the majority of his subjects, his most loyal lieutenants were tasked with executing his will. Magister Kalendris murdered many unsuspecting Shen'dralar without hesitation, but one of the doomed elves mortally wounded him during a destructive battle. Despite his demise, Kalendris's spirit still roams Dire Maul as a defender of Tortheldrin's rule. Immol'thar – In a desperate bid to restore the power and immortality they lost when the Well of Eternity was destroyed, the Shen'dralar summoned a demon into the western wing of Dire Maul and captured him within a force field, allowing them to use the void terror's energy for their own spells. Unable to fight back or even move for nearly 10,000 years, Immol'thar could only watch and wait for the day he might break free and rend the flesh of his captors. Prince Tortheldrin – After the Well of Eternity's destruction, Prince Tortheldrin maintained control over the surviving Shen'dralar by imprisoning a demon in the ruins of Eldre'Thalas and letting his subjects siphon its strength. The exposure to demonic power twisted Tortheldrin's mind, and when the creature faltered, the prince ordered the deaths of many of his vassals so only he and his most fanatical followers would be left to enjoy the corrupt energy. 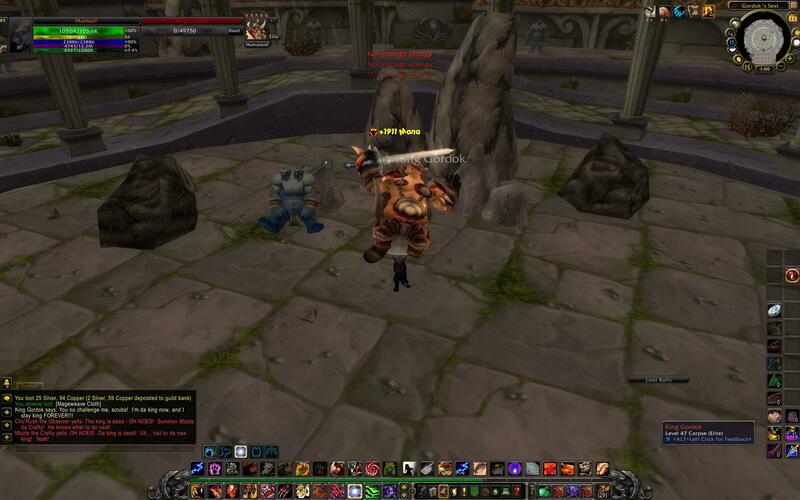 Guard Mol'dar – Mol'dar is a zealously loyal guard from the Gordok ogres. He is convinced King Gordok gifted him with a pair of enchanted gauntlets that have enabled him to become his people's arm wrestling champion for six years running. In truth, King Gordok threw the powerful armor away; Mol'dar simply found it first. Stomper Kreeg – On more than one occasion, skulking assassins have met their doom after accidentally disturbing Kreeg's ale mug. Though he's often passed out drunk on duty, nothing rouses the ogre into a berserker fury faster than the sound of his precious drink splattering on the stone floor. Guard Fengus – Ever since Cho'Rush the Observer told him he was destined to meet a mate while on duty, Fengus has spent almost every waking moment patrolling Gordok territory. Guard Slip'kik – Some might think Slip'kik is merely cautious, but he's also lazy. Rather than challenge King Gordok directly, Slip'kik tinkers with traps and old, broken magical devices, hoping to eventually deliver a coup de grace without an ounce of risk or a drop of sweat. Captain Kromcrush – Even among ogres, Captain Kromcrush is infamous for his hair-trigger rage toward anyone who dares to insult him or King Gordok. He crushes dissent ruthlessly, but he has still less patience for those who continue to spread the rumor of his torrid affair with a gnoll long ago. Cho'Rush the Observer – Cho'Rush doesn't usually take sides, but when Ulrok was rising to power, it was clear there was nobody who could challenge him. The king quickly appointed Cho'Rush as his chief advisor, believing that his twin heads would make him twice as resourceful as the average ogre. King Gordok – To rule the Gordok ogres, one must simply proclaim oneself king... and then destroy all who might disagree. King Gordok--then merely known as Ulrok--solidified his power by convincing a dozen of his people's strongest warriors to challenge the king at the same time. The wild melee left most of the contestants dead or wounded, and Ulrok's blade easily cut down the survivors and the battle-weary king. To this day, Gordok ogres speak in hushed tones about the "Day of Da Blood."